Seeing Patagonia has always been a dream of mine, not the clothing company but the actual place in the south of Chile and Argentina. It seemed like this beautiful, mystical, unreachable place. I didn't think I would end up down here even while traveling through South America but I am so glad I did. Although very expensive, the treks and sights I'm seeing are priceless. I'm slowly inching my way down towards the south to the most popular attraction of Patagonia, Torres del Paine. However, I have to say Monte Fitz Roy in El Chalten, Argentina has already blown me away. It was the inspiration for the Patagonia logo you see on your jacket, and yes now you know it's a real place. I've been asked that so many times when I tell people I'm going to Patagonia along with "I didn't know it was an actual place!" The weather down here is really unpredictable. Even during the "summer" it's windy, rainy, cold, cloudy, etc with weather only reaching as high as 70 degrees. The weather app may tell you it's sunny but the next moment it will rain and vice versa. I was at Fitz Roy and it was completely foggy and cloud. I couldn't see any clearing in the distance but within the next 1.5 hours it cleared up completely. However, I have been really lucky with the weather and have been hit with sunny, rainless weather every location in Patagonia so far. I somehow lucked out or just really good at timing the weather (you can decide that haha). Since I'm traveling for so many months and to so many different places, I couldn't bring any of my camping or hiking gear. So I bought a few hiking equipment in Santiago along with a pair of waterproof hiking boots but that still meant I had to rent a tent, sleeping bag, mat, and for Torres del Paine cooking equipment. On the day I arrived, it was absolutely beautiful so I wanted to hike out that day, trying to avoid any chance of the weather changing. But of course places had anymore tents which meant I would have to wait until the next day. The tent I got was a 2 person tent and it was not meant for backpackers because that thing weighed a ton but I didn't have any other options. I checked out of my hostel and headed out around 10am towards the campsite right beneath Fitz Roy. It took only about 2.5 hours to get in even with my giant bag - a very easy hike. I setup my tent, ate lunch which consisted of tuna, tomato sauce, cucumbers and bread. I know so gourmet right? Then took an hour and a half nap. By around 4pm I was ready to head up to see the all mighty Fitz Roy. The trek up is the hardest part of the entire trail because it's uphill but what made it harder was the wet rocks and constant water streaming down. I'm so glad I took the plunge and bought waterproof hiking boots because I saw so many almost falls and one person spraining her ankle. It took me about 1.5 hours to get to the top and oh boy it was absolutely AMAZING!! I haven't seen Torres del Paine yet but everyone has told me that Fitz Roy was their favorite because it's just as beautiful but free and less people. I'm all about the free stuff! So I wanted these few days to be a solo quiet weekend for myself so of course the downfall of that is not having anyone to take pictures of me. Of course I asked a few people but unless they are photographer themselves or understand what you want, you are never going to get the picture you really want. But that's okay I was able to set up my camera on some rocks and had a remote control, boom problem solved! I stayed up there for awhile or long enough to see a group of 4 Americans, of course they would be Americans, strip down and jump into the water. That's some balls... I was all bundled up with gloves, multiple layers, ear muffs and they were just in their boxers swimming in the freezing cold water. It's water melted from the ice so yes it's ridiculously cold. Back at the campsite I had the same meal - tuna, tomato sauce, cucumbers, and bread with some pieces of chocolate for dessert. As I said, I wanted this to be a quiet weekend but there were soooo many groups of Israelis (sorry, I don't anything against them) but they were all so obnoxiously loud. I understand having fun and all but you are in nature, and there are others around you. 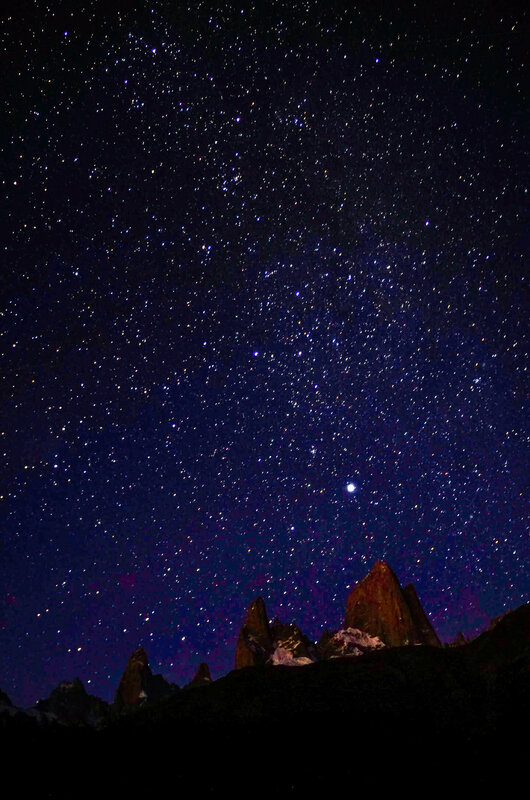 I went to bed pretty early, but 10:30pm because I wanted to wake up at 3:30pm to shoot some night photography of the stars and potentially hike up to watch the sunset at Fitz Roy. I've been having this terrible allergy the past 2 weeks and my nose is constantly runny or stuffed. It sounds like I'm sick but I feel completely fine! So at night especially, it's beyond difficult to sleep. I was rocking back and forth for awhile, in and out of sleep, but woke up at 3:30am to my alarm. Part of me contemplated not leaving my warm sleeping bag because "are stars even that cool?" However, I'm so glad I forced myself up and went out to shoot. I'm not good in anywhere but I'm practicing and getting better!! I went back down and went back to sleep until about 9am. Then I packed up, ate a bit, then headed out towards Cerro Torre, the other attraction in El Chalten. That will be for another blog! I got back into town around 5pm with bug bites on my legs (those guys had no mercy because I was wearing long pants) and bruised hips (because cursed the rental gear). Heading to El Calafate now!